Jeannie Gray Knits: Thanks Dude! Don't you just love it when a company goes out of their way to provide great customer service? On September 1st, I placed an order with Jimmy Bean's Wool but the process didn't go as expected. There was an issue with me incorrectly typing my Jimmy Bean's log-in information and once I retyped it, I immediately received a message that said I had already placed my order. Being late Friday night on Labor Day weekend I figured I'd wait until Tuesday to worry about it. On Tuesday, I checked my Paypal account & it showed the transaction as pending so I figured everything was fine. Fast forward to September 13th. I still hadn't received any kind of shipping confirmation or even a 'We received your order and we'll ship it when we get around to it' email. Paypal was still showing it as a pending transaction. Weird. I called Jimmy Bean's and spoke with the nicest young man who was extremely helpful. He researched their records 1,000 different ways and could find no record of my order. He then proceeded to be unbelievably kind and patient while I attempted to recreate my order without access to the Jimmy Bean's website. He read off the product descriptions to me and he patiently changed my order back and forth as I flip flopped between wanting Lorna's Laces Soulmate and Lorna's Laces Shepherd Sock yarn. I couldn't remember which I had originally ordered, only that it had taken me almost as long to decide between the two on the first try. Mr. Jimmy Bean's Dude was so sweet about my indecision. He even said he'd only been knitting a month or so but he already understood how important the proper fiber content was to a project. I fell a little bit in love with Mr. Jimmy Bean's Dude at that moment. I can't believe I'm a little bit in love a a dude who's name I didn't bother to catch. Oops. Anyway.... Mr. Jimmy Bean's Dude got me taken care of and promised to go pack the order himself. And even though I paid for the slowest shipping available, look at what I found in my mail box less than 48 hours later . 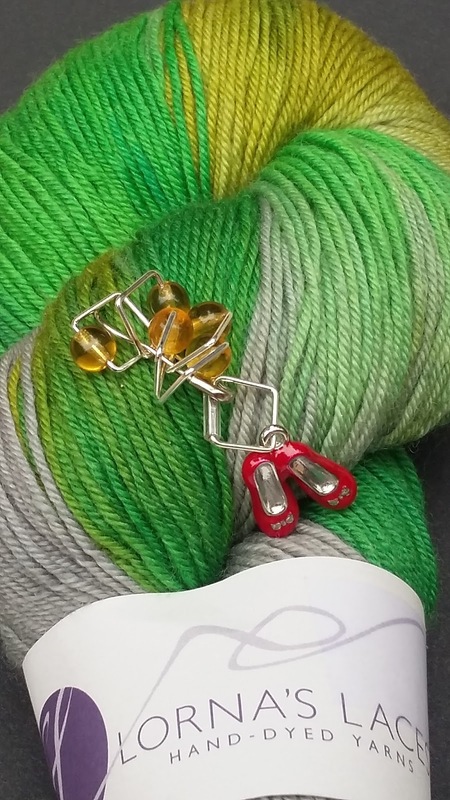 Lorna's Laces Emerald City and a coordinating set of Ruby Slipper stitch markers. Thanks Mr. Jimmy Bean's Dude! You're the best! Now, I just need to figure out what to knit with it. lovely yarn, great service and my oh my I love the ruby slippers!! I've always loved the Wizard of Oz & when I saw those ruby slipper stitch markers, I had to have them. And of course, special Emerald City yarn to match.